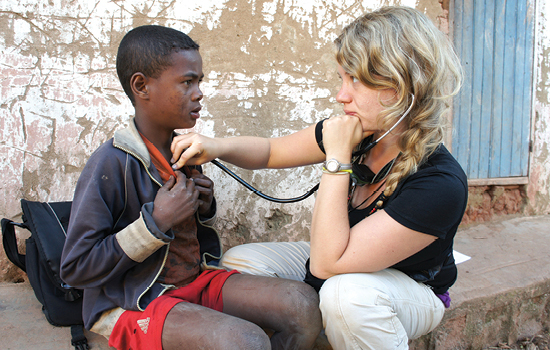 Three days after passing her NCLEX exam last year, Emily Headrick 13N 14MN climbed aboard a plane that would carry her some 9,000 miles away to Ranomafana, Madagascar. A globetrotter at heart, Headrick spent nearly a year collaborating with an infectious disease team of students and faculty funded by the Emory Global Health Institute Multidisciplinary Field Scholar program. Headrick's team focused on measuring the relationships between human health, domesticated animal health, and wildlife. For 11 weeks, the students hiked deep into Madgascar's Eastern rainforests to gather baseline data from six villages near Ranomafana National Park. Headrick ventured into communities to test inhabitants' susceptibility to infectious disease. She and her colleagues pooled their research methodologies to interpret how land-use changes affect the ecology and evolution of pathogens for the Malagasy people. The task was challenging at times. For Headrick, it was difficult to make the transition from direct care to a research project in which she was unable to treat much of the illness she encountered. In those moments, her solace came from the notion that the group's work could inform the implementation of a better primary care system for those who need it most. "One of the biggest reflections for me was that even if you don't have tangible evidence-based solutions to every problem, empathy and compassion and listening and validating peoples' pain can go a really long way," she says. Headrick is quick to point out the high rates of uninsurance, unemployment, diabetes, depression, and other conditions she encountered working domestically as a graduate nursing student at Emory. "You don't always have solutions for everyone," she says. "But developing your bedside manner (in these situations) to form meaningful relationships that empower your patients is just as important in downtown Atlanta as it is in Madagascar."